Just found this amazing video interview, conducted by Howard Riengold, with middle school teacher, Meredith Stewart. What a lovely piece of solid gold. Thank you, Howard! Thank you, Meredith! I just discovered a new tag cloud creator (or word-picture tool) – Tagxedo. This is a free online application that allows you to make word pictures (or clouds) where the most oft-used words appear largest. This is a good way to get a visual “feel” for a particular text chunk, document, or web site. 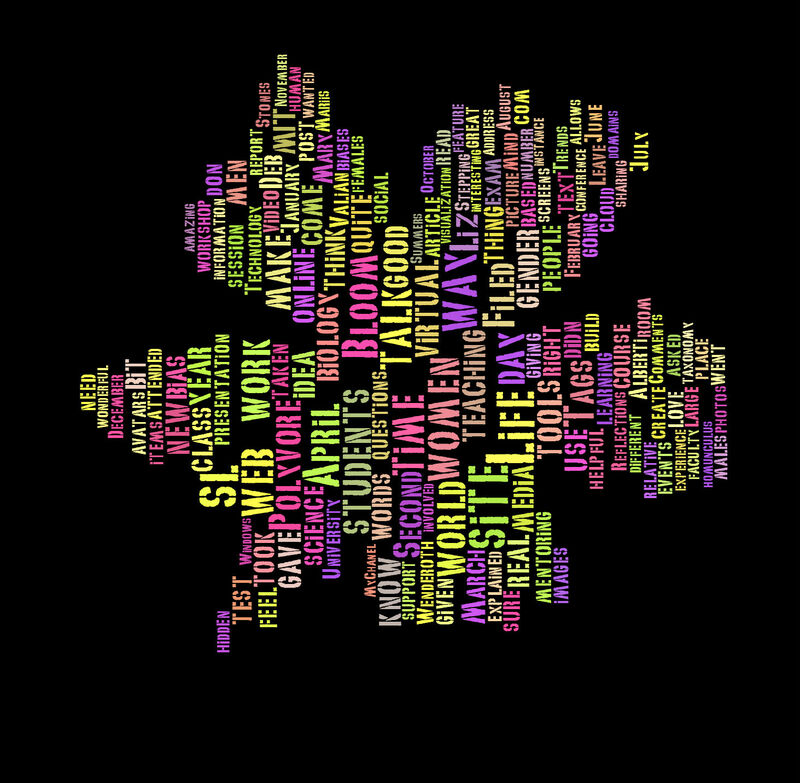 Tagxedo is similar to Wordle, but much more powerful with many additional capabilities. 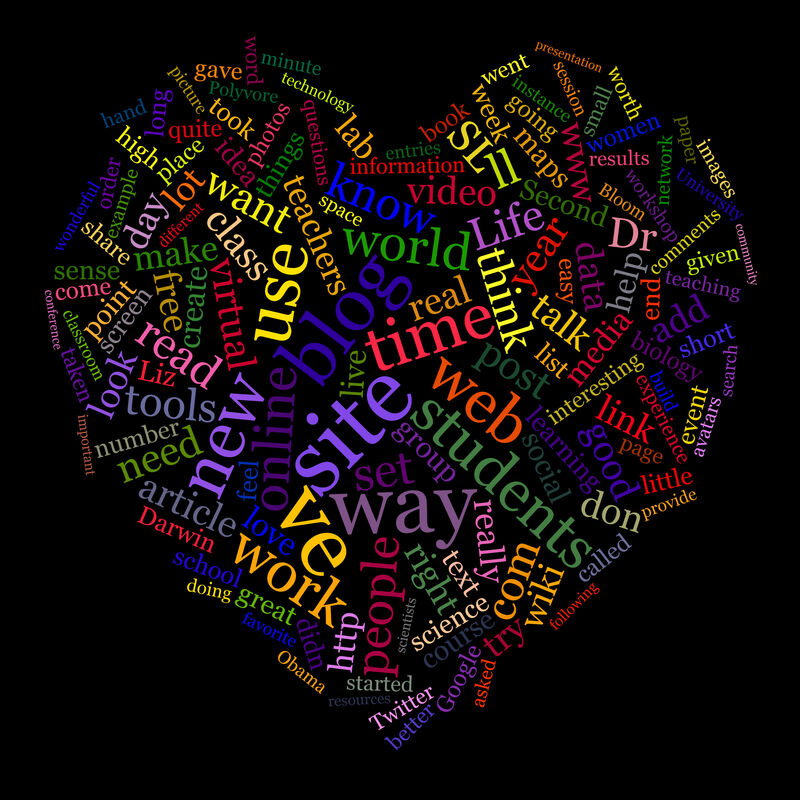 First off, as you roll over the online Tagxedo with your mouse, the words come to the front and you can make them live links. You can also spin your cloud, choose different themes (many available), select different colors & fonts, and constrain the word-picture by shapes (hearts, ovals, circles). The cloud to the right (made up of my blog’s contents), is made from the same words as the cloud at the top of the page – this time in the shape of a flower. You can structure it so that you skip words (removing unimportant words, like “the”). Apparently, you can also use photos to create the shapes – like this one of Abe Lincoln. I haven’t tried that yet, but it certainly presents some interesting possibilities. Once you’re created your Tagxedo cloud, you can save it as an image – in both jpg and png formats – at a range of resolutions. What fun. I just returned from moderating a teacher workshop at the Niles District’s (just out side of Chicago, Illinois) Institute Day. Ruth Gleicher and Anne Roloff invited me to spend three hours with a group of 10 high school teachers from the two high schools in the Niles District. The workshop was called, “Participatory Media, Learning, and Literacy” and it sprung from a session I offered at the 2009 National Association of Biology Teachers (NABT) conference. Ruth Gleicher, who is a biology teacher at Niles West HS, attended that NABT session and thought that it might be a good fit for her colleagues. Together, she and I designed an experience with a little presentation and a lot of hands-on and discussion. The session went well, I think. I sure enjoyed it! I was so impressed with this group of teachers. They were biology, chemistry, earth science, english, and special ed teachers. And they were all – to a person – hard working, creative, and very committed teachers. We started off the session, going around and introducing ourselves. I asked them to share with the others how they’re currently making use of new media tools with their students and to describe one new thing they wanted to try. So we spent the first hour or so in a candid exchange of ideas, things that worked and didn’t, questions they had, and plans for the future. I love these conversations. And I suspect that you do too – here are a few of the gems that the Niles teachers shared with each other…. Students aren’t as proficient as we think they are with online tools….they don’t know how to download a photo, they’ve never edited a wiki, they don’t understand intellectual property. Amen to that. And I would add that many of them don’t know how to set the privacy controls on Facebook, they don’t know how to create and post a video in a safe and responsible way, they are unaware of their digital footprint and how it might work to their benefit, and they forget about replicability, forwarding and the persistence of content. Our students need help with all of these things. They must become more aware of the power of online information and they must be more exacting judges of the credibility of what they find there. They need teachers to help them understand, respect, sort and discern. As teachers, we need help sorting out what’s the right tool for the job and which – if any – of the options is worth our time. Another good point! There are so many intriguing online options these days – fun tools to try, capabilities to explore, and a huge range of ways to express ourselves, demonstrate our understanding, and deepen our experience. But how to evaluate them? How to decide if the time it will take to learn how to use them well (and then show others how to do the same) will be worth it? With this conundrum, my advice is – try it yourself first. Get inside whatever the new thing is with your own projects or interests (a hobby? a small thing – just enough to learn, or maybe on something you need to do anyway). Make failure cheap. Discover the affordances of the tool for yourself and then you’ll be in a good position to judge whether or not it’s worth using it in your classroom. What I don’t evaluate or grade, my students won’t do. Yeah, I hear that a lot. The point these teachers were making was, if I don’t give credit for blogging, contributing to the class wiki, or creating an animoto, my students won’t do it. I feel their pain. I can’t help but think that much of this behavior stems from conditioning. We’ve trained our students (in our assessment-crazed, high-stakes testing world) to think in these terms. Intrinsic motivation seems to have left the building. But I don’t think that’s due to any character flaw in our students – I think that “we” have set it up this way (I was talking to a friend yesterday, who relayed the story that her kindergartner came home with homework on which “points” would be given by the teacher). But even if we agree on that, what’s to be done about it? By the time teenagers get to high school (or college) they are steeped in that tradition. What’s an individual teacher to do, in order to break the cycle? I would love to hear your thoughts on that – comments? ideas? Beth Kanter, International Social Media expert, gave the second keynote talk at the New Media Consortium’s Symposium for the Future today. It was a wonderful session on the use of social media by non-profits, chock-full of great stories and examples. She started off her session with a bang, by arriving in a Jetson’s-style vehicle, to the opening tune of the old Jetson’s TV show, wearing a pink, Jetson’s-style outfit. What an entrance! She went on to talk about what she termed, “Free Agent Fundraising”…that is, running campaigns using Facebook, Twitter, blogging, and other social media tools to raise money for a particular cause. It’s happening and it’s effective. Agencies like… the Red Cross, Environmental Defense Fund, American Cancer Society, Wildlife Direct have all become “networked nonprofits”. They are groups that have learned to work in a networked way. Simplicity. Identify what your organization does best and network the rest. Movements. Learn to work in a networked way. Or working “wiki-ily”. For example Wildlife Direct. Their basic approach is to encourage bloggers to write stories, the potential donors read those stories, donors make online donations, rangers do anti-poaching education, and the result? More and safer wildlife. The blogs are written by conservationists and others in the field – so they have urgency and authenticity. But they don’t stop with fundraising – the goal of their work is to create a powerful enough movement to be able to respond to any conservation emergency quickly and effectively. They’re not just turning on the switch and asking for money – they are keeping the network going so that, when an emergency occurs, they can catalyze the group into action. Network weaving. Think rhizomatic plants (shared root systems). One part of the plant gets nutrients, shares it with the others. Organizations need people who weave new and richer connections between and among people, groups, and networks. With that sort of weaving, the positive effects are amplified. Beth says, it’s like Fantasia and the Sorcerer’s Apprentice. Self-replicating behavior (broomsticks). These “weavers” model the networking behavior and spread it. Transparency. Beth explains that it is important for an organization to ask (and answer)…what is private and what needs to be secure? She encourages groups to be more fearless about what they share. And to inspire us, she read the Robert Frost poem, The Mending Wall. She reminds us that is important to think about where you build these walls and that those walls might need to be moved, as the plans evolve and the context changes. Sound familiar? Beth urges us to embrace those fears, start easy (with small experiments), if need be, but move on. And here are some helpful links, with many thanks to Beth. Her blog. And a fantastic wiki called We are Media, which is full to the brim of presentations, advice, tools, and tips for non-profits considering the use of social media tools to advance their agenda. A set of Darwin bookmarks on my Diigo page. I’m becoming increasingly fond of electronic bookmarking services like Delicious and Diigo. Diigo, in particular, has become my bookmarking tool of choice, because of their collaboration tools. You can highlight, add sticky notes, search, make lists, and create groups. Here’s a 4-minute video showing how the Diigo collaboration tools work. But the best way to get a feel for what you can do, is to take a look at an annotated article. Here’s an example, from Will Richardson. What he’s done is to bookmark an article (from the Wall Street Journal) in Diigo, highlight key passages and then embellish with comments using their sticky notes feature. When you’re ready, Diigo spawns a unique URL to your annotated version of the article. When others use this Diigo-created link to navigate to the article, they see your highlights and comments (roll over the highlighted comments and his sticky notes appear). In addition to reading the bookmarker’s comments, the reader can comment right back – agreeing or disagreeing with you, asking further questions, seeking clarification. With time, you can imagine a whole conversation started (and recorded) around an online article. What an interesting idea to try with science students. You could start by bookmarking an appropriate (pick a fairly straightforward one) scientific journal article and highlight it to point out the key elements. You can add your own comments (with the sticky notes) to make points that support what you’ve been talking about in class or lab. For instance, “here’s the researcher’s hypothesis” or “notice the basic structural elements of the paper” – or ask them a question “which is the control group?”. When students access the url you provide, they will see your annotations and can add their own. Let me know if you try it – would love to see a collection of Diigo-marked articles with teacher-to-student conversations. I can’t help but notice the startling contrast between the world inside school these days and the world outside of school. Outside of schools, students are talking about music they’re producing, online communities they are part of, conversations they’re having online with people at a distance, and sharing, sharing, sharing. Inside school? Well, not so much. Inside school looks pretty much the same way it has for a very, very long time. There’s a new literacy out there and, you know what? …it’s happening with or without our schools. But just think for a minute how much better it might be if our teachers, administrators, and school resources were supporting and guiding that literacy journey that our students are taking without us. Just think what teachers could contribute. Yes, students are pretty facile with all of this new media, but there’s still so much they need to know. For example, students need to know how to determine the veracity of a web site (and find out who owns the domain), how to safely navigate an online social network, how to make good judgments about what they post online, how to edit a wikipedia entry, how to navigate the sea of information available to them, how to use of the creative commons, how to curate their own work, how to connect with experts and peers – how to embed, share, mash-up, remix, and animate. The federal No Child Left Behind Act and standardized state curricula and assessments don’t reflect these literacies. There’s no doubt about the fact that NCLB and the way student achievement is measured has had a strong influence on daily life in the classroom. By aligning our schools along the narrow band of what can be evaluated in a high stakes exam, we fail to assign value to the new knowledge and skills that our youth need to become effective participants in a global, networked environment. It’s time for our schools to teach and foster responsible student mastery of new literacy forms. 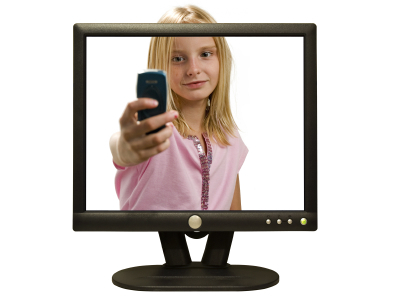 That doesn’t mean throwing away the old ones – couldn’t we augment them with the new literacies? We have a responsibility to teach students to critically understand and responsibly use these new forms of media – and in order to do that, we need to understand them ourselves. Web 2.0 is an ideal platform for this kind of participatory learning. These tools help us to reach out to others, join in the conversation, creatively express ourselves, and find our teachers. As Chris Dede says, we want students to not just be problem solvers, but problem finders – out there, working it, finding fresh areas for investigation.